Takeaway: For a severely corrosive environment, the duplex coating system ensures an extended productive life for iron and steel assets, along with an extended maintenance cycle. Two corrosion protection methods are better than one. That's the theory behind duplex protective coating systems, which combine the proven protection of galvanization with the benefits of an additional corrosion protection system, such as polymeric powder coating. Using two coatings, one above the other, can improve a substrate's ability to withstand the attack of corrosive substances in the working environment and extend the productive life of assets. Duplex systems can also extend the maintenance cycle in some cases, thus improving ROI over a project's life cycle. While the zinc-iron alloy created in a galvanized coating performs as a primer and becomes an impervious barrier film for the steel substrate, when a special polymeric coating is also added, the corrosion protection can be extended from 1.5 to 2.5 times the arithmetic total longevity of the two individual systems. In other words, if you have a polymer coating system that lasts 10 years and a hot-dip galvanized system that's expected to last 50 years for a total of 60 years (50 years + 10 years), the duplex system would actually last 90–150 years. That is, if you allow both coatings to wear out completely. Extended and enhanced corrosion protection. No other protection system matches this enhanced protection individually. Coating galvanized steel can provide an attractive aesthetic appearance, enabling the brightness and color of the steel to be matched to the specific location and environment. Because duplex systems significantly extend the productive service life of a steel product, maintenance expenses are reduced. As a result, total life-cycle expenses are also lower. Steel can be coated to comply with safety color regulations. After the top coating is worn out, the zinc continues to provide corrosion protection until the structure is recoated at site. The weathered zinc alloy on the surface facilitates repainting with minimal cleaning. The application of a polymeric coating on galvanized steel resembles the painting process of steel without any previous coating. 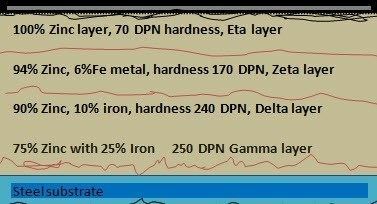 Of course, the surface preparation could differ significantly in certain cases, depending on the time elapsed after the galvanization. The ASTM D6386 standard provides the detailed procedures for surface preparation. As usually specified in a quality management system (such as ISO 9001), a complete review and clarification of customer requirements, as well as the requirements and expectations of other parties like galvanizers, fabricators, coating suppliers, painters and corrosion engineers, is very important for ensuring an effective and efficient duplex coating. The parties involved may require specific handling, storage and process specific-parameters that may affect the design or procedure to be adopted to complete the tasks. When galvanized steel is exposed to the indoor or outdoor environment, byproducts are formed due to weathering. Depending on whether it's a new surface, partly weathered or fully weathered surface, different actions are required for cleaning and profiling. There are also some surface defects of galvanizing that can be repaired by the galvanizer. The dross and skimming inclusions as well as other similar defects need to be removed. If the galvanizer is informed about the duplex coating, he or she can ensure that any such defects are removed. Within 48 hours of galvanizing, the zinc coating will be brightly shining or a dull color, and only mild cleaning and profiling will be required for ensuring the adhesion of a polymer coat. A partly weathered zinc coating will show some zinc compounds along with some contaminants such as oil, dirt, dust or grease. Some zinc compounds may stick to the zinc coating, and must be removed by grinding, profiling and cleaning to ensure adhesion of the polymeric coat. The cleaning process must ensure that the original zinc layer is not lost. If the galvanized steel surface is covered completely by zinc carbonates and other compounds, the zinc carbonate is strongly adhering to the surface and is not soluble in water. Therefore, it should not be removed. Only cleaning is required in this case. Scrape to remove bumps and drips in case of a partly weathered or newly galvanized surface. Remove oily organic contaminants, except in the case of a freshly galvanized surface. In all the three cases, rinse galvanized metal in water, clean and dry up. Use a hand grinder to remove excess zinc, if any, on a freshly galvanized surface. A 4% acid wash is sometimes used for two minutes to remove organic contaminants. Cleaning is done by brush, and rinsing is done twice after the acid wash.
Solvent is applied by using a clean cloth to remove certain types of dirt. After the water rinsing, the galvanized steel part is dried and sent to the profiling section. Profiling by surface sweep blasting is done by using mild abrasives at less than 60-degree angles. Abrasive material is selected carefully to avoid damage to soft-top zinc coating. The wash primer process is based on its acid component. The component reacts with the zinc surface, thus forming a thin film, which adheres to the zinc and the subsequent polymer coating. The acidic element of acrylic treatment roughens the zinc coating and creates an acrylic layer to allow subsequent coating adhesion. In some cases, surface grinding may be needed to improve the top profile in the case of a newly hot-dip galvanized surface. Grinders may be used to roughen the top surface to obtain a surface suitable for polymeric coating adhesion. Zinc removal should be limited to less than 1 mil. Procedures and methods used for coating and paint application vary widely for on-site application as compared to methods of coating application at the factory. In the case of on-site applications, the weather conditions, and safety and health aspects need to be kept in mind all the time. Once the galvanized steel part is cleaned and profiled, it is to be coated as soon as it's practical to do so. Coating or painting can be done by spraying or brushing on the profiled surface. Compatibility of the coat/paint formulation for the galvanized surface must be confirmed by the supplier of the coating. The galvanized surface may be tested for any passivation agents present on the surface due to quenching, as per ASTM B201. (Quenching is examined in the article How Quenching Improves the Performance of Metals.) The coating formulation has to be compatible with the passivation agent used. After the zinc-coated surface has been properly cleaned and profiled, the part is ready for baking. Water or air trapped in the zinc coating can lead to pinholes or blisters in the coating, unless the part is warmed or baked just before the coat application. After the baking, the part may need to be cooled slightly to allow the coating application. Powder is typically sprayed onto the galvanized surface. In case of a liquid coat, the application could be by brushing or spray coating. After the primer is applied, the coat will need thermal curing and quenching before the topcoat is applied. Initially, a sample piece may be coated and the effectiveness of the procedure may be checked as a precautionary measure. After the top coating is completed, the curing and quenching may be completed once again. The coating may be inspected at each stage to ascertain its effectiveness. The procedure followed in factories will be different from on-site procedures. Between automated steel plants and batch production plants, the methods may vary significantly. In most cases, freshly galvanized steels are painted or coated in the factory. The following stages are generally applicable to a computer-controlled steel factory. The first stage is to prepare the substrate for coat application. This starts with cleaning it in alkaline solution, in the chemical bath. Cleaning tanks are provided with fluid pumps, delivering output to the spray nozzles, and brush rolls with soft nylon bristles for mechanical brushing. The alkaline fluid concentration of the tank can be varied depending on the extent of the oil, grease and other contaminants on the galvanized surface. The concentration of the bath is a critical quality parameter. Next, the substrate passes through a rinsing tank, and is then readied for a conversion coating for preparing the surface profile. It passes through a tank containing a conversion coating. Alternatively a coating machine is used to apply the conversion coat to both sides of a substrate strip. Next, the strip moves to a drying oven to eliminate moisture in the conversion coating. The dried strip passes through the primer coating machine, where a coat of a primer, such as an epoxy, is applied by rubberized applicator rolls. A coat thickness of 3 to 5 microns is usually maintained. Curing is done in a centenary oven. The time and oven temperature are carefully controlled for optimum curing for the thickness of the coat and the coat material. Before the coil reaches the top coating section, it is water-quenched. A final top coat of polymer such as polyester or poly vinyl dine fluoride (PVDF) of 15–20 microns is normally achieved in the final coating section. Other coatings used are acrylics, PVSF, plastisols, vinyls and alkyds. The specified top coating thickness is achieved by varying the concentration of the coat substance, coil tension and speed of the system. Final curing is completed in the subsequent centenary oven, where the oven temperature and speed of the coil are carefully matched. The coated coil is finally quenched and cut to size as per customer requirements. Samples are tested for corrosion resistance. This test is conducted as per ASTM 2774-84: impact test method. This method checks a coating's tendency to crack and lose adhesion under impact loading. In a bending test, the sample is tested as per ASTM D4145-83, using a bending machine. Any delaminating, peeling or cracking will be treated as sign of failure. The test is also conducted after the primer coat to ascertain what concentration of conversion coating bath and primer coating bath concentration is adequate. This test determines the resistance of the coat to cracking on 180-degree bending. It is done by using a conical mandrel. The procedure followed is as per ASTM D522. Susceptibility to mechanical damage during handling is evaluated by a pencil test (hardness test). ASTM D3363-74 procedure is followed. This test is important in case of exposure to acids, alkaline substances and their compounds. Separate samples are immersed in 5% alkali (Noah) and in 5% acid (H2SO4) solution, respectively, for one day. Color changes, blistering, cracking, disbanding and loss of gloss are recorded. This procedure is outlined in ASTM B11. This test is used to predict a coating's ability to protect steel in an atmosphere laden with salt and moisture. Salt spray is prepared by a 5% sodium chloride salt solution. The corrosion noticed after a fixed interval is recorded. Coat suitability for a marine environment is indicated if the sample does not corrode. This test indicates the ability of the coat to work under high-temperature conditions. A muffle furnace is used for this test. Blistering, loss of gloss and color change is observed after heat exposure on an hourly basis. This test follows ASTM 4752 and is an indicator of a coating's tendency to peel under the influence of a methyl ethyl ketene chemical solvent attack. MEK is rubbed on the coating 100 times with the help of cotton wool. Any peeling of the coating is carefully noted and recorded. It is an indicator of the coating's solvent resistance.